Building the 845 MW Shepherds Flat wind project—one of the largest wind projects on the planet—involved a tremendous amount of teamwork from developer Caithness Energy, contractor Blattner Energy, and their group of suppliers and subcontractors. Exactly how does a contractor go about planning construction of one of the largest wind power projects on the planet? 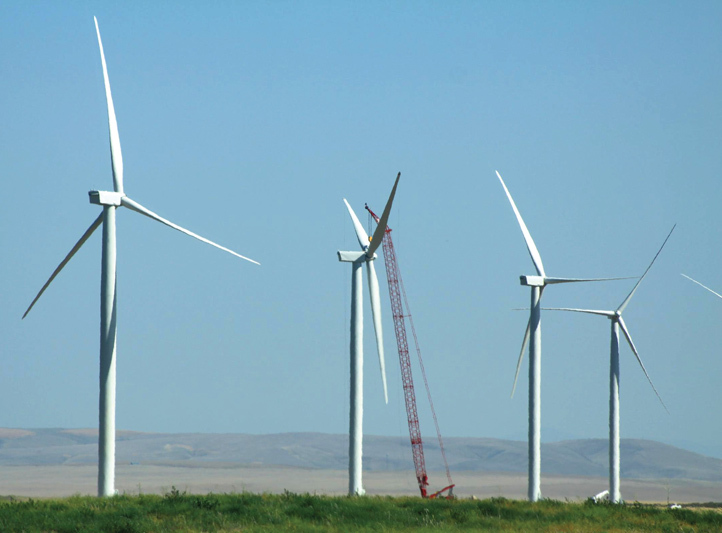 First off, you roll up your sleeves and do one heck of a lot of planning, says Ludlow (Lud) Howe, project manager for Blattner Energy, the Balance of Plant contractor on the massive 845 MW Shepherds Flat wind project recently completed in Oregon for independent power producer Caithness Energy. "We first assembled a team with electrical engineers and estimators, and the estimators broke out the project into the various disciplines—civil, electrical, and the erection portion," explained Howe. "Once the estimators had worked out a preliminary estimate and how they thought the job was going to go, we looked at it from an operations standpoint and worked out exactly how we were going to build it." This was a process to which they dedicated a good amount of time, he added. "It took us, I don't doubt, a solid three months. We were meeting every day in the Blattner Energy corporate office in Minnesota, talking about the details of Shepherds Flat and determining how we were going to approach a job that was possibly going to take three years to build. We just knew it would take dedicated collaboration between Blattner, Caithness, and all members of the project team." The sheer scale of the $2 billion project was what distinguished it from smaller wind projects that might take, at most, a year to complete. Shepherds Flat is a true mega project, with a total of 338 GE 2.5 MW turbines. At 845 MW, it is the second largest wind farm in the world. Only the 1,020 MW Alta Wind Energy Center in California, also constructed by Blattner Energy, is larger. Shepherds Flat covers 30 square miles in two counties in the Columbia River Gorge area of north central Oregon. This area, which has been developed with a number of other wind farms, has a good, robust wind resource, with wind speeds up to 6.7 m/sec. Blattner Energy put together a seasoned project team for Shepherds Flat, drawing upon its experience of more than 18,000 MWs of wind power installed in the U.S. Appointed project manager, Lud Howe has overseen a number of wind power projects in the Pacific Northwest for Blattner and installed about 1,000 turbines for the company, working out of their regional office in Montana. While every wind farm project, regardless of size, has numerous details that need to be covered, this is even more so for a project the size of Shepherds Flat, explained Howe. Essentially, as the saying goes, the devil is in the details. "And there are thousands and thousands of details," he says. Howe says that even though they spent three months planning, there were some aspects to the job that still required fleshing out once the project started. Blattner knew they needed a large labor force—which peaked at 600 workers—but it was still a challenge to find accommodation in, or near, the town of Arlington, Oregon. The project was done in three phases, though it was not necessarily 100 percent sequential—workers and equipment were often moving around from one phase to another. "There was a lot of reasoning behind the approach to build the project in three phases," says Howe. "The power purchase agreements that the project owner (CaithnessEnergy) had called for certain milestones to be met in certain areas, and the PPA's drove, in part, the three-phase approach." There were the north, central, and south phases. Construction of the Shepherds Flat Wind project involved some impressive numbers. Some 95 miles of access road had to be built, and 338 wind turbine foundations were poured, requiring 150,000 cubic yards of concrete. "But what was going on in any phase depended on a number of factors," he added. "At a point in time, we were doing turbine erections in the north and central phases and building foundations in the south, and it could be switched around." The very first project, though, was an upgrade of a Bonneville Power Administration substation, to handle the increased power. They also built a transmission line from one of the project's substations to the BPA substation. In some areas, environmental considerations drove the construction schedule. In the northern area of the site, just off the Columbia River, there is a curlew population, and they have a nesting season from August to December. "Curlews are a protected species, so we could not work at all during that time period. So we'd build as much as we could of infrastructure in the north, and then we'd have to shift construction down to the central area, and when restrictions were lifted in the north, we'd go back up there." Since Shepherds Flat was a multi-year project, the same restrictions applied the next year. "At that point, we were quite far along in the north but not finished. We already had the wiring in and the foundations built, but we couldn't erect in that area for three months, so we moved to another phase of the project. And we could do that because we were only about 50 percent done in the central area and 20 percent done in the south. "There were also nesting grounds for hawks. Because the land mass for the project was so big, there were a lot of little pockets that we had to work around at certain times of year. And it wasn't just a matter of a couple of weeks, it was three months." All of this, however, was known upfront and included in the planning process. Howe added that Blattner Energy takes pride in minimizing the impact of any project it works on, in terms of the environment. "It really was a well thought-out and planned job, and it had to be—we were moving people and equipment back and forth from one phase to another, and we had to maximize their productivity." Howe likened the approach they took to moving a military operation, with people and material going back and forth, as required. Two large office complexes and laydown areas were established to accommodate not only Blattner personnel, but staff from the owner, Caithness Energy, turbine supplier GE, and subcontractors. At the peak of construction, Howe estimated there were about 30 construction cranes on site. "We would have had nine big cranes—500 to 600 ton cranes—and upwards of 20 mid and smaller cranes, everything from 30 ton units to 130 ton cranes." There were further impressive numbers. They built 95 miles of access road and poured 338 wind turbine foundations, requiring some 150,000 cubic yards of concrete. They used a local concrete supplier from Arlington. "But at any point in time, there were probably four or five trucks coming from Portland, to keep their silos filled with cement." A concrete batch plant was built off site and another on site. "As we moved on the project, they moved with us," said Howe. They excavated, drilled, and shot their own gravel on site, with royalties paid to the landowners. They dug two wells for water for the concrete and utilized an existing well one of the landowners already had in place. Because they were moving from one phase to another, this required some extra planning on the roadbuilding side. "You'd think that you might be able to do 20 or 30 miles of road because of where you were working, but moving around, you might have to move and open up another 20 miles of road. And you have to have water trucks to help build the road and keep the dust down." He said they likely had about 26 water trucks on site at the peak. Despite the large site, there were only five landowners on the project. "We were very conscious of working closely with them," said Howe. "We have built several other projects in the Columbia Gorge area, so we either knew the landowners, or knew of them, and we met with them a number of times before starting the project. "We showed them what we were doing and how we were going to do it and asked what their concerns were and how we might work around their concerns." Requests were minor for the most part and included moving a road 50 or 100 feet so the landowners could more efficiently farm an area. They also worked closely with Gilliam and Morrow counties, where the project is located. "We met with officials from the counties to discuss what we were doing and component deliveries. We knew what we were doing would involve some road repairs, so we planned for that." The delivery routes were well planned out, as well, since loaded trucks could not deal with road slopes greater than 10 percent. GE Energy brought most of the blades to a nearby rail yard, and they were trucked in from there. The project is the first wind farm in the U.S. to use GE Energy's 2.5xl wind turbines, which are larger than its other models and use permanent magnet generators and turbine technology that improves efficiency, reliability, and grid connection, helping to lower wind energy costs, says the company. The 2.5xl wind turbines for the Shepherds Flat wind farm were assembled at GE's site in Pensacola, Florida. In addition to supplying the wind turbines, GE is also providing operational and maintenance services to the project. Caithness Energy was the lead developer of the project, and one of the partners in Shepherds Flat is Internet giant Google. At $100 million, Shepherds Flat is the largest investment Google has made in renewable energy. There was a total of 162 miles of collection wiring, about 22 miles of overhead collection, and another 140 miles of underground collection. That went into three different substations and a three-mile 500 kV line to link into the BPA system and its huge substation. As mentioned, Caithness Energy was the lead developer of the project. Partners in the project include GE Energy Financial Services, Tyr Energy (a unit of Japanese company ITOCHU), Sumitomo Corporation, and interestingly, search engine giant Google. Google invested $100 million in the project. Shepherds Flat is the largest investment made by Google in renewable energy. The U.S. Department of Energy issued a partial loan guarantee of $1.3 billion for the project as part of the Recovery Act. Electricity generated by the project is being sold to utility company Southern California Edison, through a 20-year purchase agreement. The project will help the company meet a 33 percent renewable energy by 2020 mandate. was the electrical contractor. GL Garrad Hassan provided engineering, technical, and construction management services. Other services included technical assessment of the project area, installation of equipment, and construction. Mott MacDonald provided technical and financial analysis and assisted in achieving financial closure for the project. DawsManufacturing supplied heat exchangers for the turbines. Hot-dip galvanizing was used by Daws to protect the heat exchangers from corrosion. 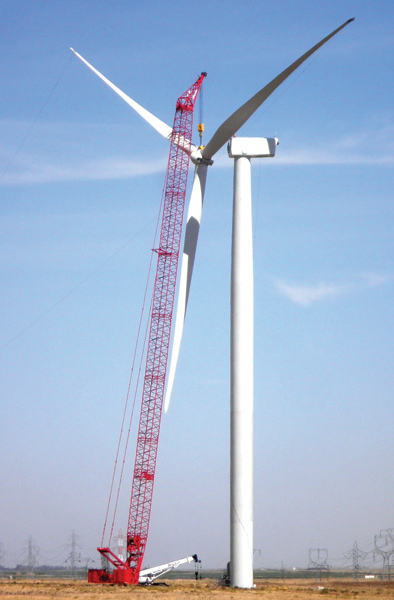 Pacific Coastal Steel provided steel reinforcements for the wind turbines. The 338 turbines are equipped with Winergy 2.5 MW high performance gearboxes and couplings. Winergy, of Elgin, Illinois, supplied its compact and high efficient PZFB 3494 gearbox combined with its ARPEX ARV4 coupling. Howe reports that keeping everyone from the owners' representatives to subcontractors to suppliers in the know and on track required a very disciplined approach to sharing information. The Blattner team utilized a methodical communication process to ensure this requirement was met. It began every day at 6:00 a.m. with a meeting for all the foremen and the subs, going over what was done the previous day, what the plan was for the current day, and what the plan would be for the next day. A general safety meeting followed at 7:00 a.m. "Then, at 8:00 a.m., we'd have another meeting with the owners and suppliers to coordinate what we discussed at the earlier meetings," said Howe. Even with all the planning and coordinating in the world, building such a large wind project involves good old-fashioned hard work. There was plenty of that. "We regularly worked 60 hours a week to deliver the project on time—this is especially important for Blattner as we have never missed a COD. Our experience in modifying work shifts to handle weather delays and schedule changes allowed us to ensure the project milestones were met. "We have a lot of experience working in this area of Oregon, so we knew what the bad months were for construction and what we needed to do to counteract that. Progress was monitored very closely, and if we started getting a bit behind, we had a couple of alternative plans that we could go to, which would bring us back to where we needed to be." That said, they still ran into some unpredictable bad weather with high winds, when the crane lifts were few and far between. "The wind started blowing, and it never seemed to stop," said Howe. "It would blow for a week and then might stop for a day. Then it blew for another five days and might have stopped for a night. You can plan all you want, but you can't plan for that kind of weather." Howe credits the strong teams on the project—on the part of Blattner and its construction partners, including its subcontractor, RosendinElectric, to the suppliers and owners—for pulling together and getting the job done within the prescribed deadlines. Howe also noted there was a great sense of pride in that. "With a project like this, there are going to be some trying times, but it really was a great project to work on." At the completion of the project, there was some celebrating and, of course, an official opening with the usual mix of politicians. After three years on a very demanding construction job, many people involved in actually building the project just headed home, anxious to spend time with their families, says Howe. A common parting comment was, "See you on the next big one."